Homonyms are two words that are spelled the same and sound the same but have different meanings. The word "homonym" comes from the prefix "homo-," which means the same, and the suffix "-nym," which means name. Therefore, a homonym is a word that has the same name as another word, meaning that the two words look and sound exactly alike. A simple example of a homonym is the word "pen." This can mean both "a holding area for animals" and "a writing instrument." Another example is "book," which can mean "something to read" or "the act of making a reservation." In both cases, the sound and spelling are the same, and only the definition changes. Homophones, Homographs, Homonyms: What's the Difference? Homophones are words that sound alike, thanks to that all-important suffix "-phone," which means sound. Homophones have the same sound but different meaning, and they are often spelled differently. For example, consider the word "fate" and "fete." Fate is an inevitable outcome, but a fete is a festival or party. Homophones may or may not be spelled the same, because the definition is really about the sound. Homographs are words that are spelled the same, as indicated by the suffix "-graph," which means writing. Homographs have the same spelling but different meanings and usually different pronunciation. For example, consider the words "tear" and "tear." Tear can mean drops of water from the eyes; on the other hand, it can mean to rip paper into pieces. Either way, the spelling is the same, but not the meaning or the sound. 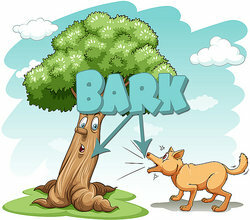 Homonyms have characteristics of both homophones and homographs. As mentioned, they are words that are spelled alike (like homographs) and sound alike (like homophones). Homonyms are a special case, and they are best thought of as the center portion of a Venn diagram that shows the overlap between homophones in one half and homographs in the other. While homophones are likely to get you in trouble when it comes to spelling - as anyone who's ever mixed up "accept" and "except" can attest - homonyms are more of an issue when you're quickly skimming something. For example, if you aren't paying attention to context clues, reading a story about a king who wants air can be confusing for a moment. Is he in danger of suffocating, or is he asking a minstrel to sing a song? Fortunately, context clues clear up any confusion for most readers within moments, and comprehension is not an issue. Homonyms can be more confusing for young readers or people learning English as a second language, usually because they aren't yet familiar with alternate definitions of a word, but our list of common homonyms will help you learn the differences. The bottom line about homonyms? If you ever come across a word that just doesn't seem to make sense in its context, check for alternate definitions. You may just have a homonym on your hands, and you'll feel much smarter when you learn the secondary meaning of one of these tricky quirks of the English language. "Examples of Homonyms." YourDictionary, n.d. Web. 23 April 2019. <https://examples.yourdictionary.com/examples-of-homonyms.html>. Homonyms are two words that are spelled the same and sound the same but have different meanings. The word “homonym” comes from the prefix “homo-,” which means the same, and the suffix “-nym,” which means name. Therefore, a homonym is a word that has the same name as another word, meaning that the two words look and sound exactly alike.